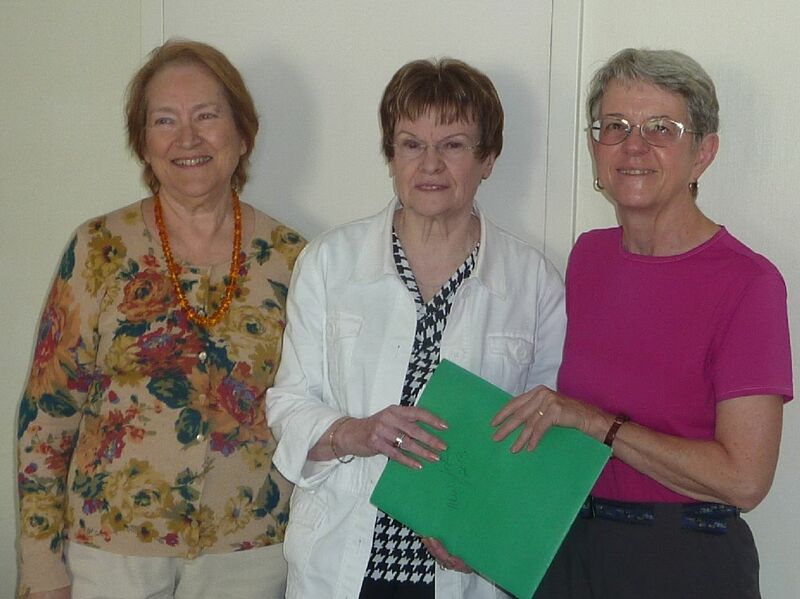 L to R: Fiorenza Albert-Howard, Chair of the CFUW Charitable Trust, Ann McElhinney, Treasurer , and Susan Murphy Immediate Past President of CFUW. Susan Murphy, immediate Past President of CFUW, and her friend Monika Oepkes just completed a 22 day trek of 500 kilometres on the Camino de Santiago in northern Spain, and arrived in Santiago de Compostela on September 6th. Their walk was a fundraiser for the CFUW Charitable Trust to raise $100,000 in celebration of the CFUW 100th Anniversary Project in 2019. All funds raised will be used to help increase the number of National fellowships and awards presented in that year. Susan presented Fiorenza Albert-Howard, Chair of the CFUW Charitable Trust, with donor cheques from many CFUW clubs and members, friends and family, on Thursday September 25th at the CT Annual Meeting in Toronto. Murphy said, “The walk was beautiful, but long, hot and sometimes difficult. However, knowing that we had such strong backing often made our steps lighter. We were excited to walk and very grateful for the support.” This was the pair’s third Camino experience and second as a fundraiser. This entry was posted in Uncategorized on September 26, 2014 by cfuwadvocacy. OTTAWA, September 8, 2014 – On the occasion of International Literacy Day, CFUW calls on federal, provincial and territorial governments to address the troubling growth in low literacy among Canadians. According to the latest Programme for the International Assessment of Adult Competencies (PIAAC) carried out by Statistics Canada on behalf of the OECD, 48% of the Canadian population has literacy skills below level 3, the internationally accepted level required to function in a modern society and to be fully component in many jobs. This represents a nearly 8% increase since the last assessment in 2003. While the rates of low literacy are similar for both women and men in Canada, women with low literacy skills are more likely to be unemployed or employed in lower paying jobs than men with similar levels of literacy. Elevating the literacy skills of women and girls in particular, is therefore an important way to help reduce poverty and gender inequality. CFUW questions the Government of Canada’s decision to cut core funding to national and provincial literacy organizations as of June 2014. Employment and Social Development Canada (ESDC) has instead assembled a pan-Canadian network focused on improving the labour market outcomes of Canadians. ESDC sought proposals from organizations to join the network, however many literacy groups were not selected and are therefore currently reducing their programs, services and staff, or closing all together. Today, CFUW joins the International Federation of University Women (IFUW) and affiliates in over 60 countries to mark this important day to raise awareness about illiteracy and low literacy, particularly among women and girls, around the world. Together, CFUW and IFUW are pressing governments, as well as educational bodies to take all steps necessary to eradicate illiteracy and low literacy. Action must include drafting and implementing legislation and concrete policy frameworks that identify measurable goals and benchmarks to tackle the global literacy shortfall. All programs for action must recognize and make provision for the increased vulnerability of women and girls, who account for two-thirds of the 774 million illiterate people in the world. This entry was posted in Uncategorized on September 8, 2014 by cfuwadvocacy.